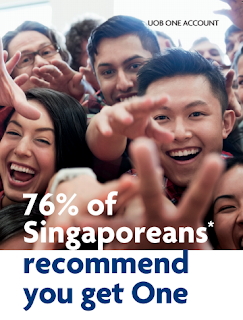 A few weeks ago, I've started seeing this ad all over the MRT stations and newspapers and it got me curious. Remember my #1 tip on growing your savings? 1. They have fewer ATMs compared to DBS / POSB, which would give me less temptations to withdraw my cash. 2. It is no secret that their 360 account provides the HIGHEST interest rates among all the other banks' savings account offerings in Singapore. At up to 3.05% interest that was easily earned, I was happily getting 2-digit payouts every month, which was good enough for me given that some finance bloggers here earn the same percentage returns on their investments. It gave me enough cushion against the impact of inflation. 3. I would have to purchase $40k of unit trusts/structured deposits OR pay $8k of annual endowment premiums to get the last 1% interest. Both of which I have none, and don't believe in getting at the moment. 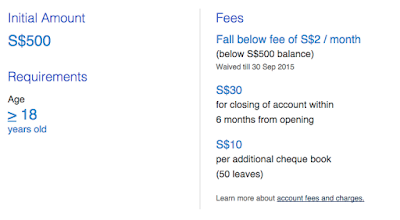 In other words, it is now harder to earn the same high interest rates on my OCBC 360 savings account than it used to be. 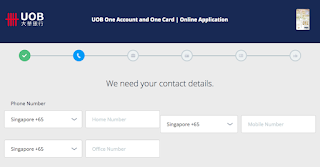 I was just about to read more about UOB One to consider if it was worth switching, when UOB emailed me and encouraged me to open an account so that I could experience it for myself (instead of just listening to their marketing claims). I was only happy to oblige. Their benefits really got my attention. 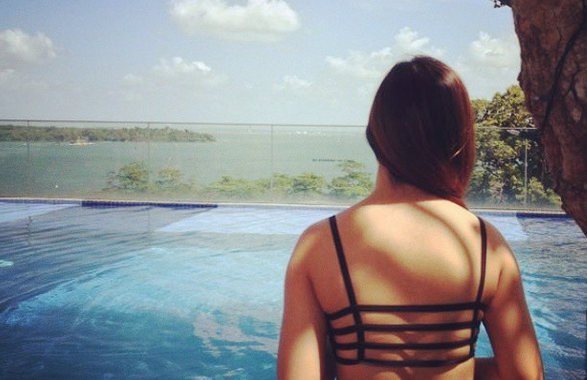 That's a lot less work than what I have to do with OCBC 360! Almost $1,000 for just a little effort in switching, that sounded really attractive to me. What I really liked was also how EASY it is to apply and open an account. After you're done with the details, you can customize (do you spot the spelling error here?) 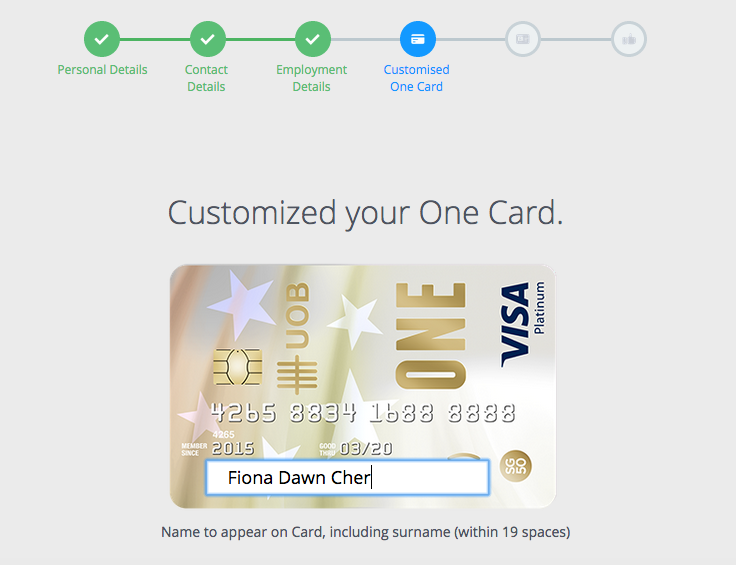 how you want your name to appear on your credit card. I really love the classy design they chose for this card (it makes me feel patriotic :P). Submit soft copies of the following and you're done! It literally took me just 10 minutes to complete this! 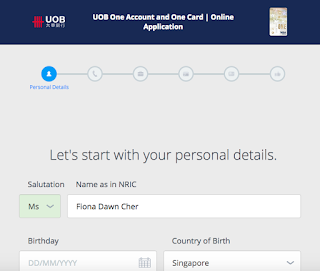 For someone as time-pressed as me (some of you might have already seen my crazy schedule on Facebook), the convenience was a god-send as I didn't have to travel down and wait in line for a UOB retail staff to serve me (which was how I opened my OCBC 360 account). Not to mention that their design is GORGEOUS. 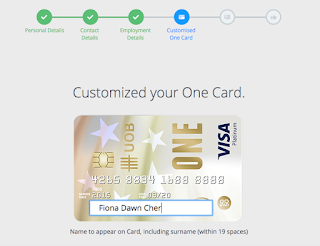 Seriously, I've never seen such a sleek and gorgeous sign-up page from a bank before! It made me feel happy while filling up each page. 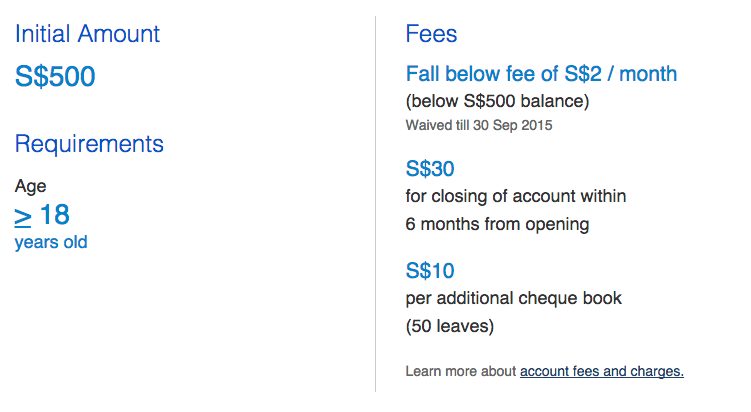 In light of the recent flak over Standard Chartered Bank raising their fees, I was also satisfied to see that UOB clearly communicated their relevant account fees on the website together with the rest of the benefits. Not that we have to worry, since you'll probably be putting $10,000 and above into this account anyway to take advantage of those attractive interest rates. 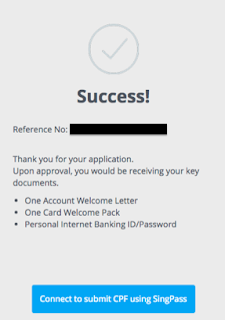 I also liked the fact that they did not automatically enrol me into their promotions (a box I always have to look out for when signing up as a new member anywhere else). Very transparent and ethical indeed. Not only does UOB One require less actions from me, they also pay out higher interest rates. Do note that UOB One's interest rates are calculated on a tiered basis. For more information, please consult your local UOB rep.
UOB One will now be replacing OCBC 360 as my default savings account. 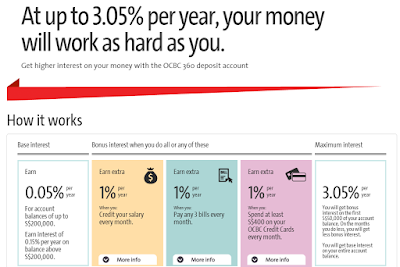 If, like me, you've been disillusioned by OCBC 360 after their recent changes, you can consider UOB One given that you can earn higher returns with lesser effort. 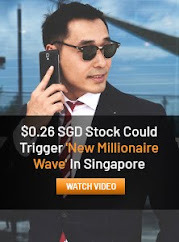 I've already signed up with them, and if you have between $10,000 - $50,000 of cash sitting in another bank, I recommend that you try UOB One for yourself in lieu of the higher returns you can get. This feature is brought to you in collaboration with UOB. I think Uob's interest is tiered, so your last diagram might appear misleading? 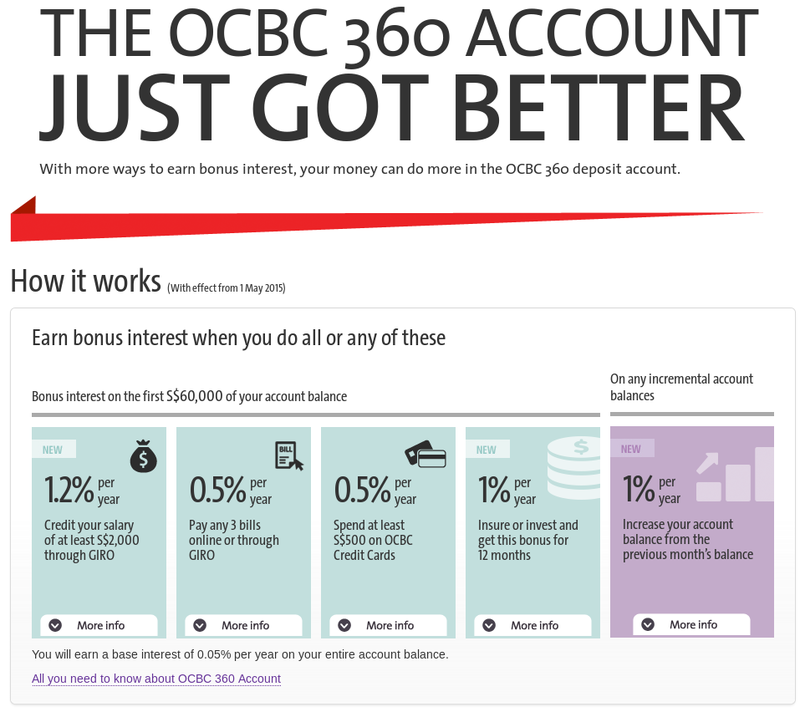 I don't think ocbc's 360 account is an inferior product. Hey T! You're right, I've had feedback on that too so I'm in the midst of editing the table to reflect it more accurately. I don't think OCBC 360 is inferior, but it's been quite frustrating trying to chalk up the same interest rates after having enjoyed the high returns for so long :( ah well, can't say we didn't see it coming! 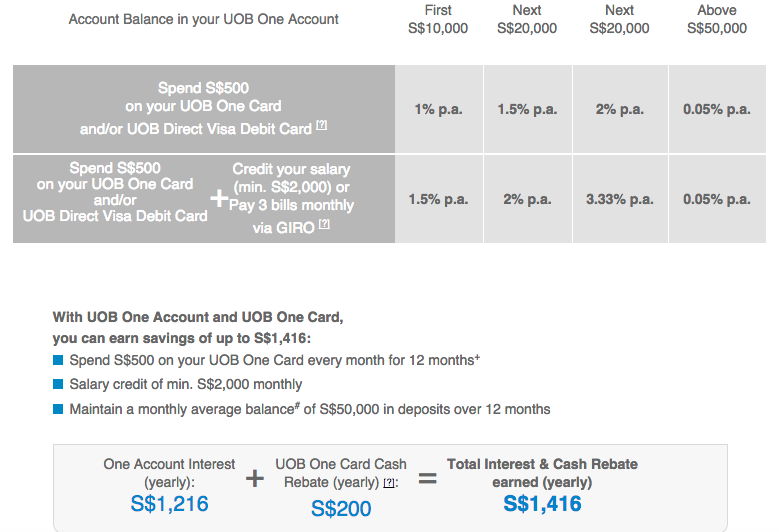 Actually OCBC 360 is superior than UOB One, unless your balances are between 42k to 54k. The tier-ups of UOB One isn't as honest as one think it is. It can be superior depending on how one is able to meet the requirements to qualify. 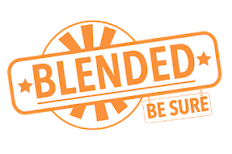 I used to be a huge fan of OCBC 360, but their newest revisions has not been very palatable as I now have to do even more for the same interest rate. What do you mean by "the tier-ups aren't as honest as one thinks it is"? Hi Budget Babe, your last table could be misleading. First, you need to commit at least $500 on credit cards spend each month to be eligible for extra bonus. Else, it is only 0.05%. Because it is tiered bonuses, maximum effective interest rate (EIR) on the One Account is 1.60% p.a. 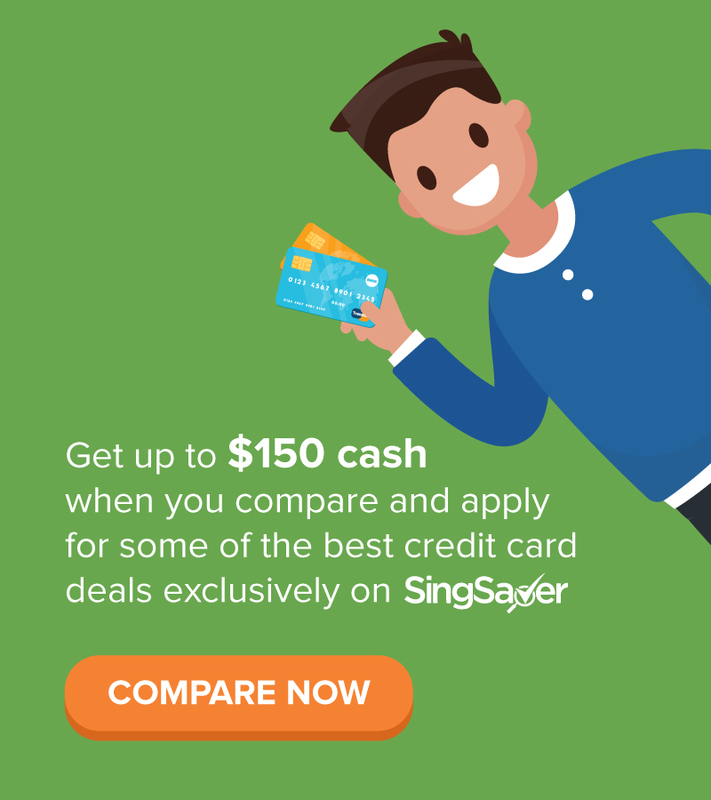 for deposits of S$50,000, provided customers meet the criteria of S$500 Card Spend. Maximum effective interest rate (EIR) on the One Account is 2.43% p.a. for deposits of S$50,000, provided customers meet both criterias of S$500 Card Spend and S$2,000 salary credit or 3 GIRO debits per month. Oh dear, does it still come across as misleading? I actually modified it after I had some feedback that the original table came across as misleading. Is the new one still bad? How would you suggest I change it? The first criteria of credit card spending is actually illustrated in the table I took from UOB. I actually thought it was quite clear from there that if you do not even spend that CC amount in the first place, then you fail to meet the first requirement for the interest rate. Appreciate your feedback and hope to hear back from you on further edits! Many readers like to scroll all the way to the last portion for summary. So, your summary table has to be precise. Especially now you are the popular finance babe, advocating personal finance to many "newbies", your words could affect their "real benefits". Changing it right now....let me know what you think of the new version! Great effort! It looks much better now. I think every account has it pros and cons. 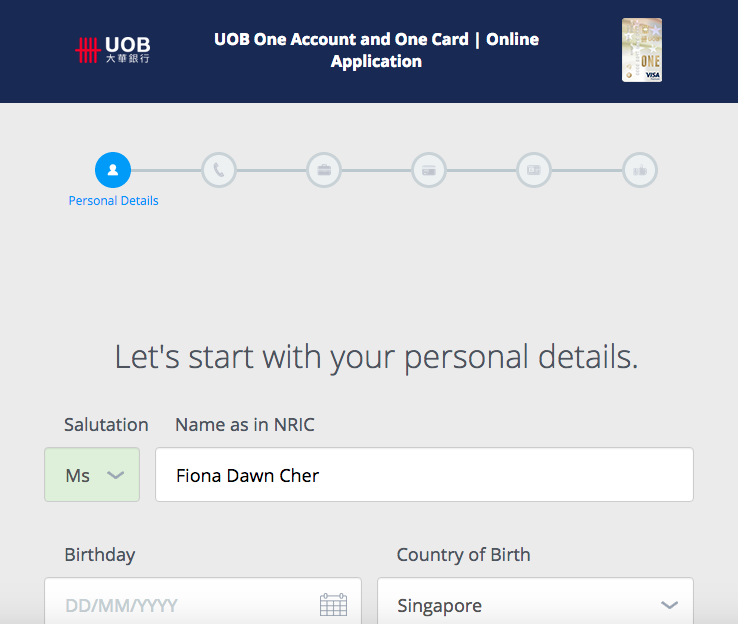 I actually think OCBC 360 and UOB One is almost on par, depending on one lifestyle habit. 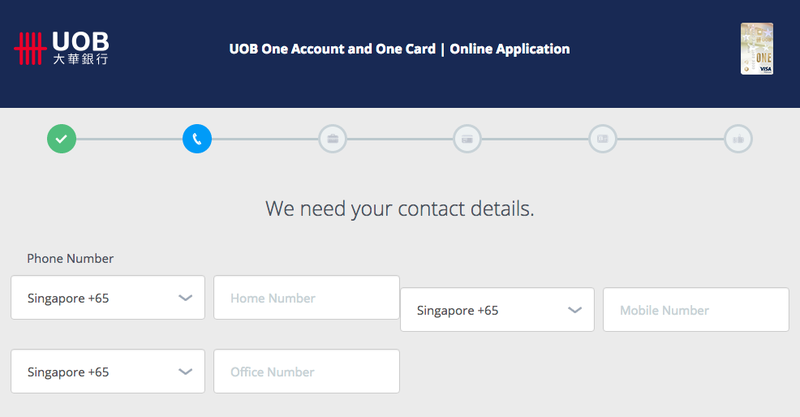 Uob one provide up to 5% rebate on credit if you can spend $2000 a month for 3 months. The catch for all these rebates need 3 consecutive months if i am not wrong. 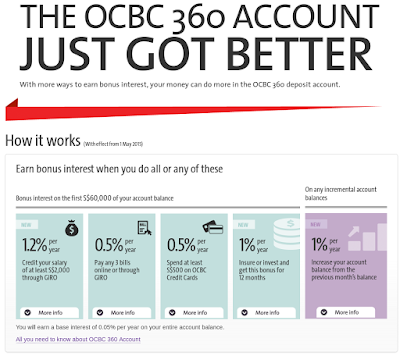 There are other components in OCBC 360 that earn extra interest not compared here. However, I have to say UOB One is attractive enough. At least at the moment until we can find other better products. Thanks. Looks like they have a good IT team with them too. Wow, you already beat me to it! I've also been eyeing their UOB Lady card since I started work a few years back, but haven't gotten it yet. Sometimes too many CCs confuse me. I was honestly quite impressed with their design and IT. Especially considering it's coming from a bank! Thumbs up from an ex-advertising girl. 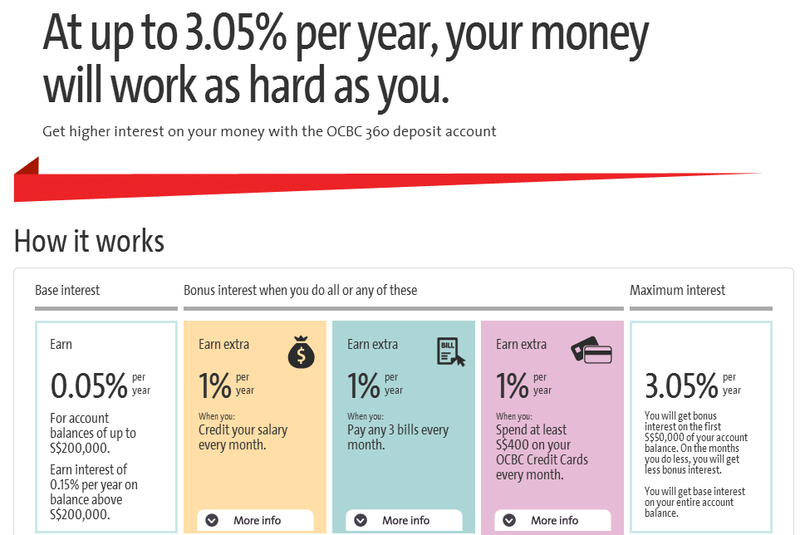 Hi, given your age and purely assuming that you don't have a fixed monthly income from a full-time job right now, I would think the OCBC 360 account might be more suitable for you right now since the UOB One requires a minimum credit card spending in order to qualify for the higher tiered interest rates. You can always switch accounts when you're older :) and yes, it is good to start saving early! Good luck!